It’s no secret – we Canadians know how to whip up one tasty meal. And we can all agree that nothing takes the shine off a delicious dinner more than cleaning up afterwards. This is why it’s key to have a quality dishwasher to take care of the dirty work. Built-in Dishwashers: Most built-in dishwashers are installed below the kitchen counter and hold around 12 place settings; you’ll also find tall tub dishwashers that accommodate up to 16 settings. 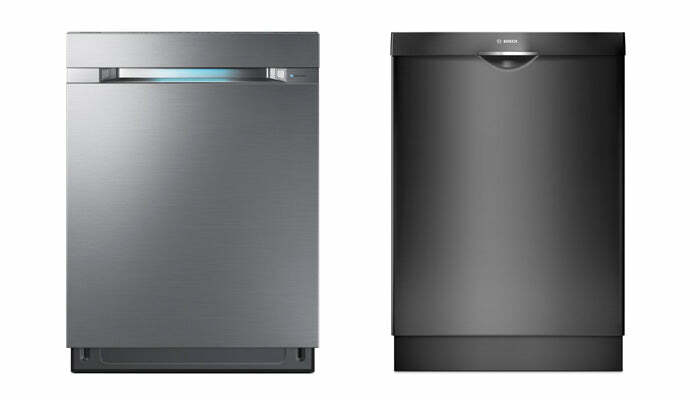 Some built-in dishwashers are panel-ready, meaning you can customize the exterior to match your cabinets. The result? A seamlessly styled kitchen with a five-star look to go along with your five-star cooking. 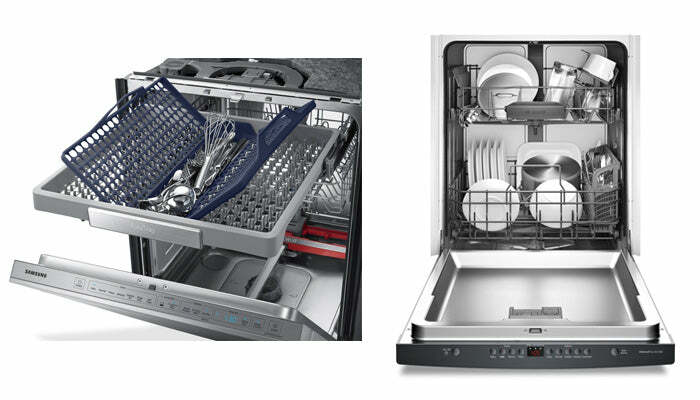 Small Dishwashers: Is the standard 24-inch-wide dishwasher more than you and your kitchen need at the moment? A compact dishwasher could be just the thing: 18-inch models generally hold up to eight place settings, saving you precious space. You have your choice of portable and built-in. Portable Dishwashers: If installing a permanent, built-in model isn’t an option due to a temporary living arrangement or unusual kitchen configuration, fear not! A portable dishwasher may be your ticket to hassle-free cleanup. These include countertop and stand-alone models with wheels, and both can easily be hooked up to the sink and stored when not in use. Noise Reduction Technology: Quickly becoming a hero to sensitive ears across Canada, noise reduction technology is now built into many advanced machines, allowing them to run between 40 – 46 decibels for near-silent operation. Bosch even offers 38-decibel models – some of the quietest on the market. Adjustable Racks: Tired of choosing between closely packing your fragile dishes and running two separate loads? Many premium washers have three racks instead of the standard two, allowing for extra room for all of your dirty flatware. Others have an adjustable top rack to accommodate tall dishes underneath. ENERGY STAR® Qualified: When it comes to going green, Energy Star-qualified dishwashers put conventional models to shame, on average being 12% more energy efficient and 30% more water efficient than standard models. You’ll not only save money off your utility bills, you’ll feel good about doing your part to conserve energy and water. Delay Start: Popular brands like GE offer a delay start of up to eight hours, allowing you to easily preset a cycle before bed and then rise and shine to a load of fresh, clean dishes for breakfast. QuickWash: Brands like Frigidaire and Bosch offer a QuickWash option for light loads. This feature will have your dishware sparkling in 20 minutes or less. Sanitize: Did you know your cutting board is one of the top 10 most germ-covered items in your house? Sanitize cycles, such as those found on Maytag models, target and kill 99% of bacteria – perfect for items like cutting boards and baby bottles. Once you’ve decided on a dishwasher that’ll make kitchen cleanup a breeze, the next step is saying sayonara to your old one. But before you hook up your new kitchen helper, how do you safely remove the old built-in model? And where do you dispose of it? Once you buy a dishwasher from The Brick, just sit back and let the experts take care of everything for you. Our certified and highly-qualified technicians are available across Canada to help, and appliance removal may even be free as a part of your installation. In most markets, even if you choose to install the new dishwasher yourself, the delivery team can remove and recycle it for you for a small fee, leaving you to enjoy your new appliance. For more information, see your closest store or check out our Installations FAQ here. There’s nothing worse than having to spend time and money on repairs soon after you purchase something. That’s why for hard-working appliances like your dishwasher, a warranty plan is important to consider. In fact, some experts recommend getting a warranty for any appliance over $500. 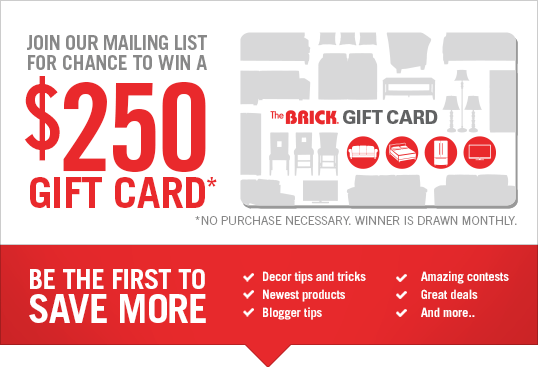 This is where The Brick’s Protection Plus Plan comes in handy. The Brick operates Canada’s largest network of technicians. Our techs are so good, they even provide appliance service for our competitors and manufacturers! They take expert care of any issues that may arise once your manufacturer’s warranty expires, and service is done in-home for most areas. Two final reasons not to gamble with your peace of mind – If you have to deal more than three functional repairs caused by manufacturer’s defects during your warranty period, we’ll replace it at no charge as a part of our “No Lemon” guarantee. And, if you invested in a Protection Plan but did not need to make a claim, you are entitled to a merchandise credit at any Brick Group store for the full amount you paid for the Protection Plan, less taxes. Being worry-free is priceless, and our 100% Value Back guarantee makes it a smart investment – even if you never need to use the coverage.